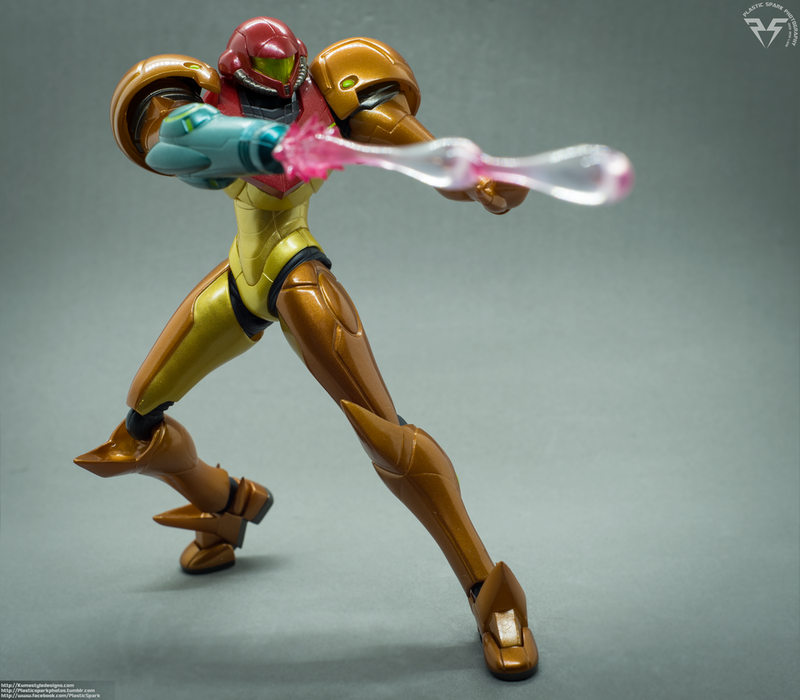 Figma Samus is a great rendition of the character in articulated plastic. She's big, imposing and highly articulated. Check out the review and let me know what you think down in the comments! 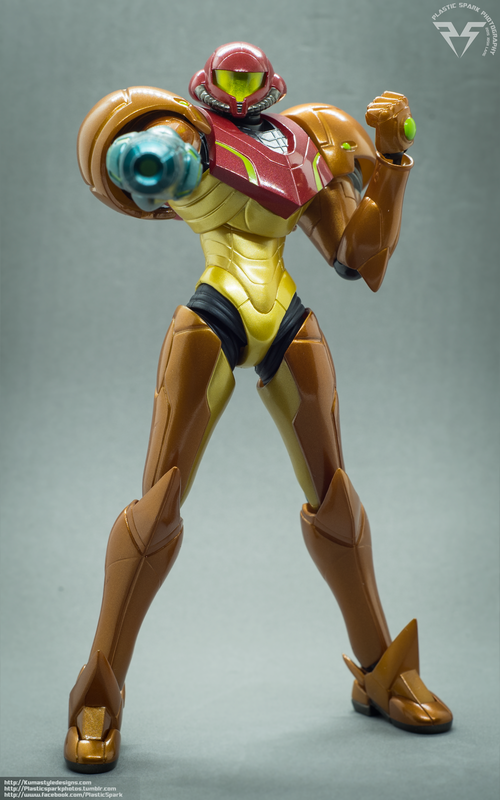 Figma Samus Aran is based on her appearance in the Wii title; Metroid: Other M. Though it is a slightly updated design it is still evocative of the original design for the Varia suit going all the way back to the original Metroid games. There are some slight differences of course, the suit is slightly more streamlined and the shoulder armor is probably where it deviates the most in having the smaller, smooth round shoulder pads instead of the spiked armor with circular patterns. The suit is also a bit more muted in design, missing a lot of the glowing “vein” detail that some of the other versions have instead opting for more subtle applications of a glowing green detail on her visor, shoulders and chest as well as her cannon and hand armor. 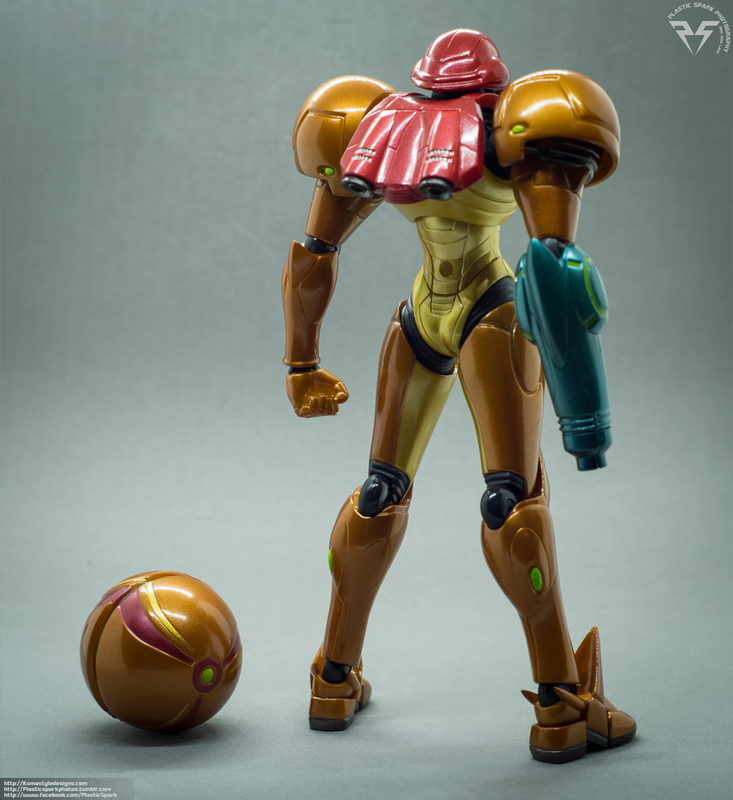 Samus’ armor is recreated as faithfully as possible including her rear thrusters and backpack, helmet and cannon arm. The cannon arm has interchangeable tips to represent standard mode and missile mode, but no other designs were utilized for the cannon. It might have been nice to see a little more variation, maybe some swap out parts or a swap out cannon arm altogether to represent some of her other abilities but all in all it’s a very satisfactory package. A really nice detail was to use a soft black plastic between the legs and pelvis with some overlap so that when posing Samus’ legs there is less chance of breaking the smooth lines of the sculpt and allowing her to look more natural even in more extreme poses without the tell-tale give away of hip joints, something that is really a treat when photographing a figure like this. 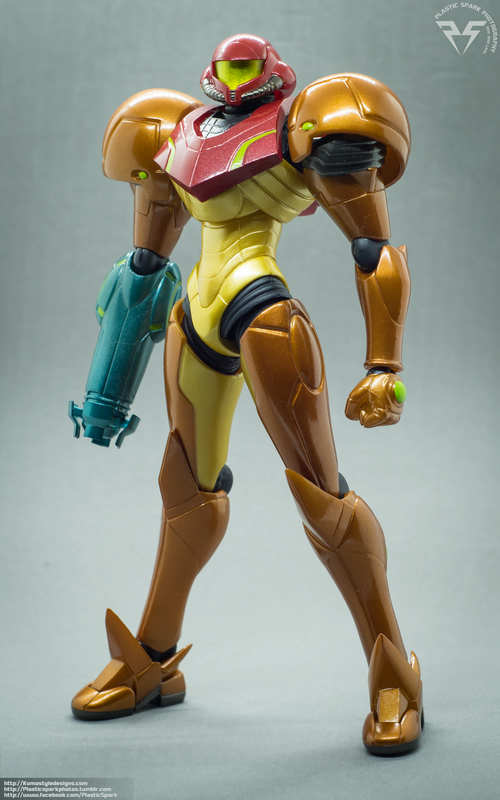 One of the first things you might notice when you take Samus out of her box is that she is incredibly heavy for a Figma release. A lot of her armor appears to be solid chunks of plastic and there is a great in hand feel when messing with this toy. Despite the added weight all the joints and strong and they can all hold their own when posing. The knee joints are possibly the weakest link on my copy but I had very little issue getting the figure in to any number of poses. Despite her large and bulky chest and shoulder armor she has great upper body posability with a double ball joint set up in the shoulders to allow for a white range of movement, and then a not quite full outward swing on the arm as well, contained within the shoulder armor. Both arms have deep single joint elbows and her hand has the typical peg and swivel style of Figma hand joint. All of the movement is seamless and does little to nothing to break up the sculpt of the figure. She has a ball joint in her abdomen, below the chest armor, this can allow for a nice upper body twist in place of a typical waist joint that would have rendered the figure looking a bit broken in my opinion. Her hips can swing forward and backward and out to the side without any trouble and as mentioned before the black ribbed plastic between the thighs and pelvis help to hide the hip joints when posing. She has deep single joint knees and swivel and pivot at the ankles as well as a toe joint. She is incredibly stable when posing though she can be a bit top heavy and may tumble if she is off balance. I really don’t think there is natural pose you can’t pull off with Samus, the only real restriction is in her chests ability to move forward but I feel that is a natural limitation of the armor and would be no different on a real person. Her head is on what I think is a double ball joint set up, socket in the body and one in the helmet, the head can be a bit tight to move but it does move side to side, up and down and can tilt slightly, enough movement to bring life to most poses. Accessory count is a bit light but given the original retail price for Samus I think it’s pretty fair. If you paid an aftermarket price for her though I wouldn't blame you for feeling a bit underwhelmed in the accessory dept. 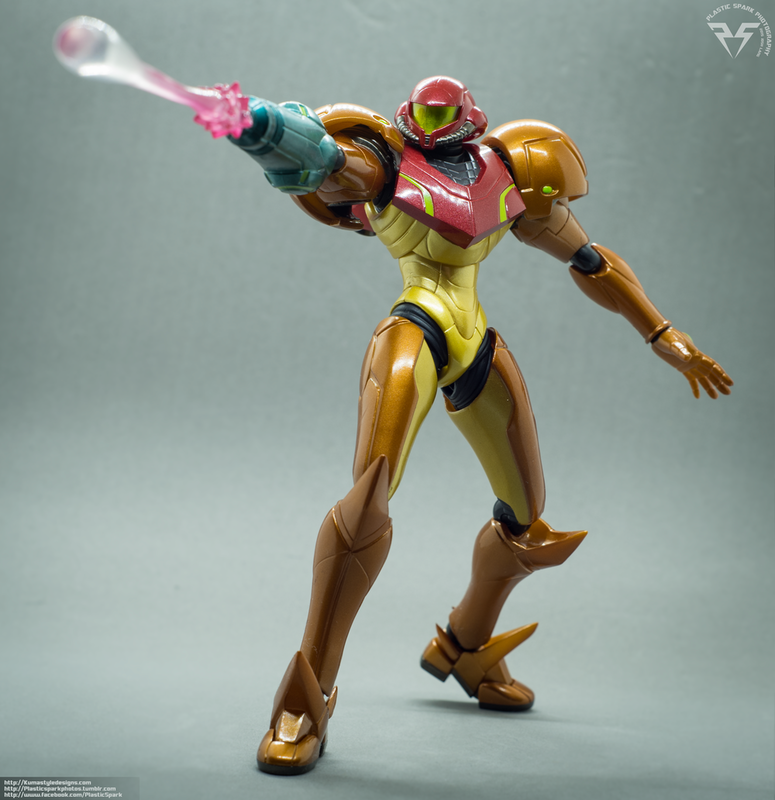 She comes with 4 extra interchangeable hands (5 total) 1 closed fist, 1 gripping fist (though no accessories to hold with it…), 1 Splayed hand for action poses, one calm hand and one depicting her trademark “Thumbs up” or “Thumbs down” expression from Metroid: Other M.
She also comes with 2 beam effects, one with a single projectile and one with a double projectile. Both effects are nicely rendered in a clear plastic with pink accents. They slide in to the barrel of her cannon with no real effort required and despite adding weight her cannon arm is still capable of holding itself outstretched with either effect attached. Her final main accessory is the Morph Ball. This is a separate representation of Samus when utilizing the Varia Suit’s ability to morph to fit in to small places, access vents, tunnels and underground passageways. Samus has used this ability in almost all of her games and is one of her key tactics for exploration, combat and evasion of enemies. In the games Samus is also capable of utilizing small plasma bombs while in this mode, however no plasma bomb accessory is included. There is a peg hold on the Morph Ball to allow it to attach to a Figma stand for bouncing poses. She also comes with the standard Figma hand tree and Figma stand that are included with all Figma releases. Figma Samus is a fantastic purchase. Plain and simple. 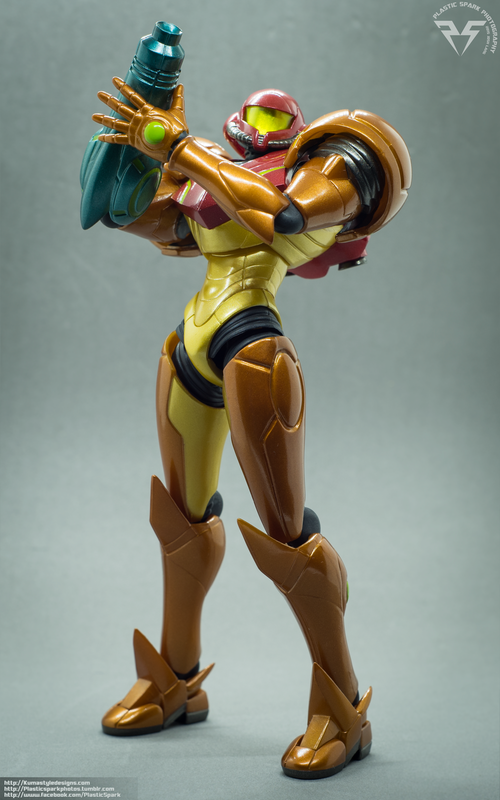 If you like Metroid, or if you want to set up a Smash Bros. display Figma Samus fits the bill perfectly. I could do with a few more accessories, a Missile effect part and Plasma Bomb spring to mind immediately… on a more unrealistic level I would have loved maybe a visor with her face visible behind it as an option instead of the opaque visor. 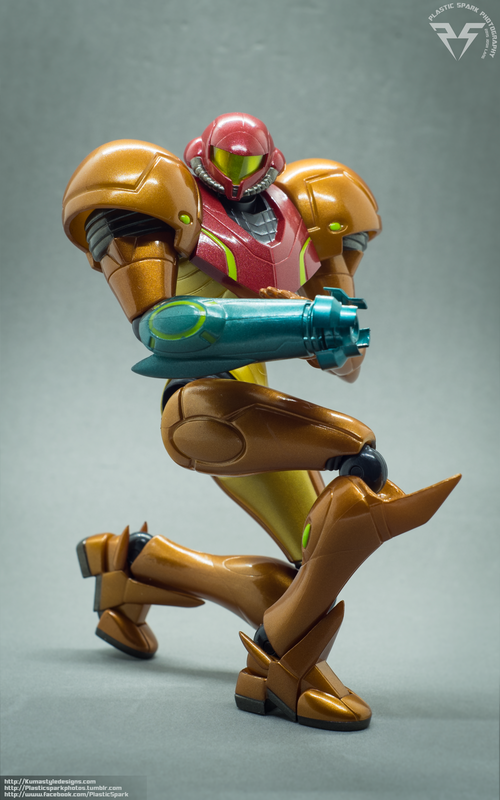 There’s also Zero Suit Figma Samus in the works soon as well that will be a nice compliment to this figure and I'm looking forward to seeing if there is any interplay between the two figures once she’s released, maybe some shared effect pieces or something. She’s a solid figure in hand with great posability and a great re-creation of the source material, even if you over pay slightly I think you will be happy with this purchase in hand, definitely a recommended pick up. A+!